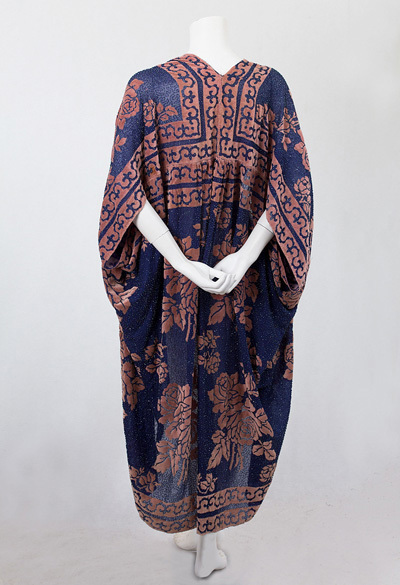 I love the cocoon-shaped evening wraps of the early 20th century. The fluid, unstructured shape seems to take on the personality of the wearer. This brings to mind of the great modern dancer Isadora Duncan. Both her costume and dance were infused with her personality. She was also a collector and wearer of antique costume. 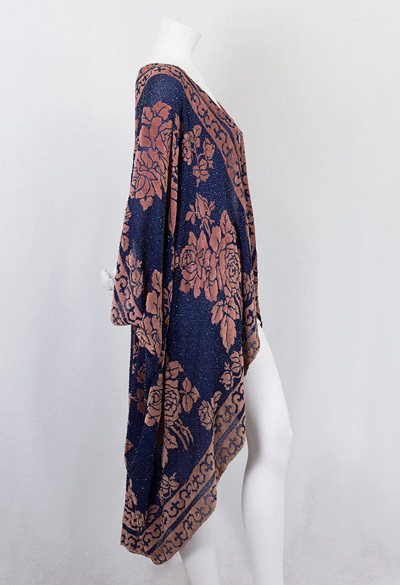 The elegant wrap is fashioned from dusty rose colored velvet cut to a ground of navy blue chiffon. 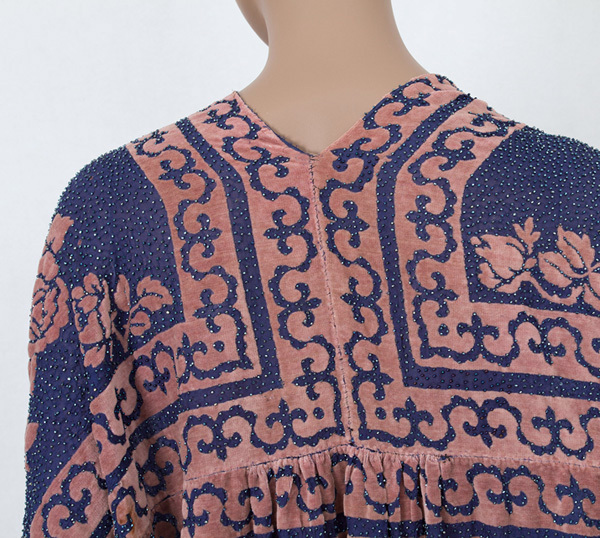 The navy chiffon sections of the design are covered with iridescent glass beads. The plump velvet roses are bordered with bands of meandering fleur-de-lis. The cocoon wrap is completely hand sewn. The inspired design has a strong, graphic quality that will make a strong impression on the viewer. There is an engrossing charm in the sublime roses in bloom. With their gorgeous verisimilitude, they have a haunting beauty. The devoré technique reminds me of the fresco technique used by early Renaissance painters. In both methods, the surface decoration becomes an integral part of the underlying substrate. 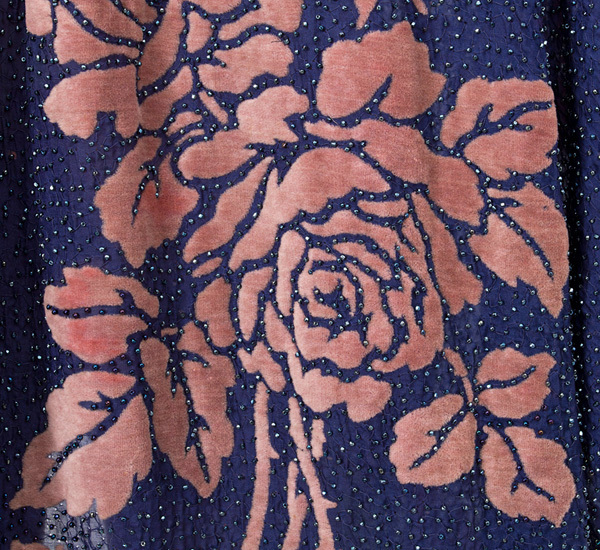 In the early 20th century, devoré velvet was generally reserved for the grandest garments like our wrap. This is an evening wrap for the aristocrat of style, who dresses with flair and impeccable taste. She accepts admiration from the cognoscenti but disdains it from the multitude. In 1810 George "Beau" Brummell was at the top of everyone's best dressed list. Here is how he rebuffed an unwanted compliment. When a young man praised Brummell's attire at the Ascot races, Brummell reminded the fellow of first principles, "I cannot be elegant as you say, since you have noticed me." 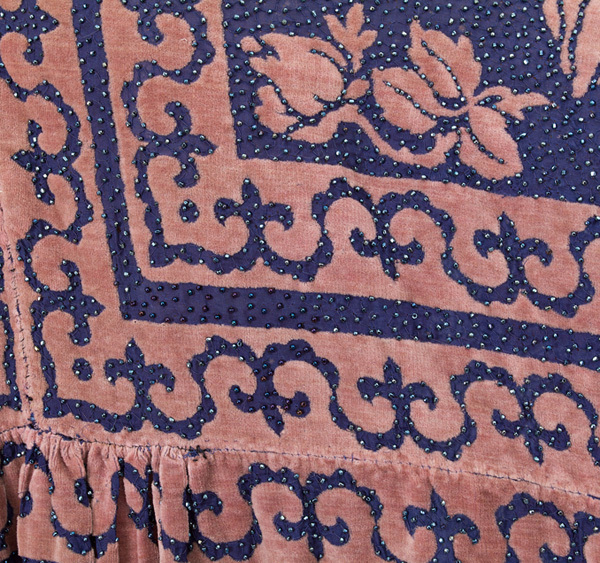 Although velvet was first made from silk in the Middle Ages, the devoré technique was invented in France only about 100 years ago. The process uses a chemical gel to dissolve (devour or "devoré" in French) cellulose plant fiber to leave shadows of silk chiffon amid deep velvet pile. 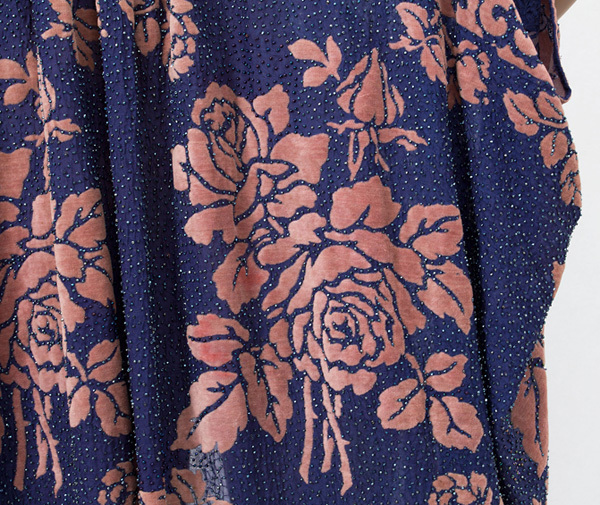 Devoré velvet became all the rage in the 1920s and is just now making a comeback. The condition is almost excellent. 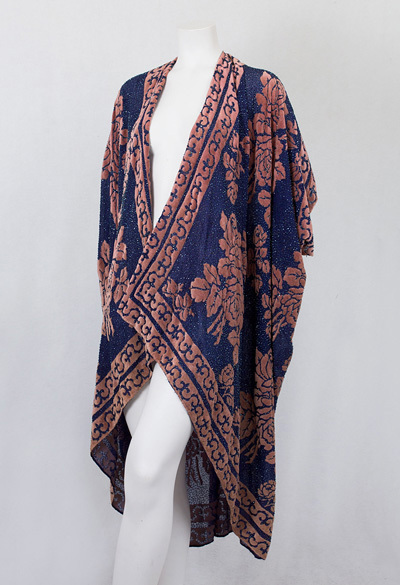 The wrap shows gentle wear and is sturdy enough to be worn. The wrap is 47" long at the center-back.